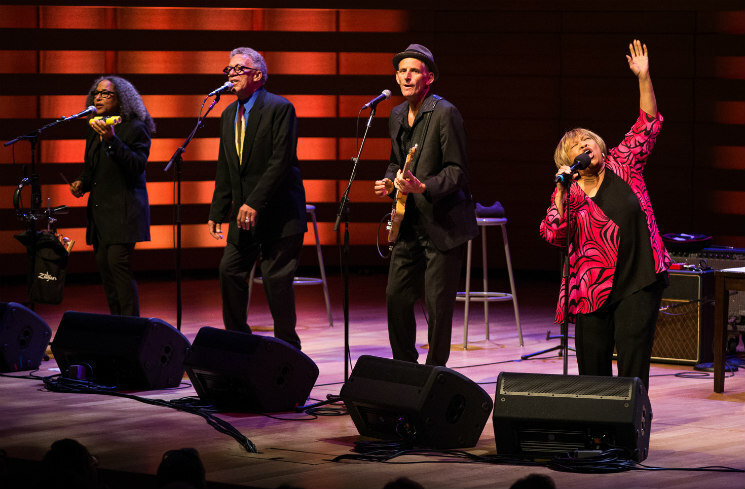 The warm, positive energy generated and diffused by Mavis Staples last night (June 27) caused perma-grins on many a face in the crowd. Calling Staples a living legend feels trite, yet apt: the 77-year old from Chicago has been singing and performing for 60-plus years — first, of course with family act the Staple Singers (headed by late patriarch "Pops" Staples) and then by carrying on the Staples name as a surviving member. Indeed, she tells us she is a survivor — a Selma survivor, a reference to her being a key part of Dr. Martin Luther King's civil rights march from Selma to Montgomery, Alabama in 1965. There's an effortless quality to her commanding voice, a soothing and liquid contralto still intact after all these years, and in that method she controls a room. Given her political presence, the full house leaned in when Auntie Mavis bantered about "a lot going on right now in America." There was a pause, before a celebratory shout out to the 2016 hometown win of professional baseball's Chicago Cubs. Staples came to celebrate, not pontificate. So she kicked off a set as only she can, her and a five-piece backing band gracing us with numbers like "For What It's Worth (Stop, Hey What's That Sound)" and staples like "Love and Trust," "Touch a Hand, Make a Friend" and the ever-present self-empowerment anthem "Respect Yourself." At one point in the set, Staples had to sit down, briefly, winded and perspiring. "I am tired. But I keep on," she said, with a smile and a deep laugh. And one of the greatest American gospel-soul singers of all time did exactly that, leading us to a rousing version of "I'll Take You There" while imploring the crowd to sing along.